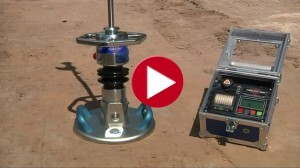 A little while ago we put up a new product video about the Light Weight Deflectometer TERRATEST 5000 BLU on our Youtube channel. In 3:18 minutesyou will find out all about the world’s first wireless Light Weight Deflectometer with Bluetooth technology and voice navigation – click here. The video demonstrates impressively the advantages of a wireless Light Weight Deflectometer in practice. “The cable connection of the Light Weight Deflectometer used to be its Achilles’ heel. We replaced it with a Bluetooth connection, creating a tremendous practical advantage”, says Frank Schulz, TERRATEST’s general manager. “The user no longer has to rewire the device for every test; no wire gets in the way while working”, explains Schulz. Many users know what it means to bend down and rewire the Light Weight Deflectometer, which has a lifetime of more than 10 years, every time you want to conduct a test. The wireless signal range of 10 metres makes the Light Weight Deflectometer TERRATEST 5000 BLU a perfect test instrument for utility line construction, since the measurement electronics can easily be placed outside of the trench.